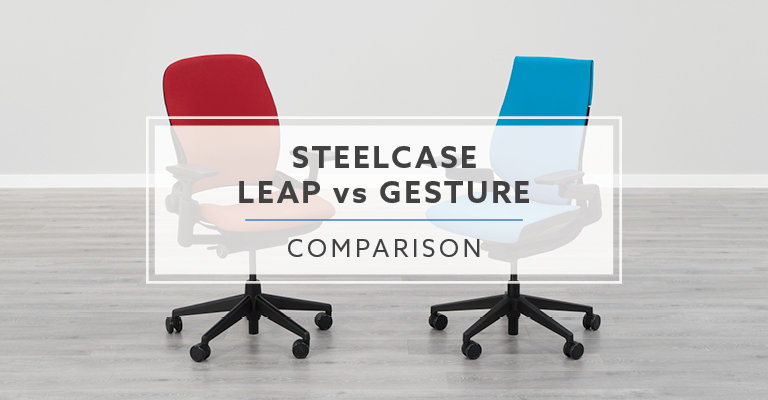 Steelcase Leap vs. Gesture Chair: Which is best? 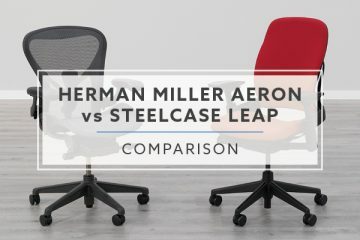 You are at :Home»Product Comparisons»Ergonomic Chair Comparisons»Steelcase Leap Chair vs. Steelcase Gesture Chair: Which is best? Today, we are taking a closer look at our top-ranked ergonomic chairs for 2019, the Steelcase Leap and Gesture chair. Each product was designed to fit a wide range of users and includes almost all of the ergonomic adjustments you could need. Is either of these chairs a good fit for your office seating needs? Let’s take a closer look to find out. Weight Capacity 400 lbs. 400 lbs. If you decide to purchase either chair online, the options available are somewhat limited. Both the Leap and Gesture are available as a standard height and as a stool. Each is available with the same 80 fabric upholstery options and six leather upgrades. Each will also have an option to upgrade the carpet casters to a hard surface caster. The Leap is available with a two-way adjustable lumbar system standard, while the Gesture requires you to pay extra for it. All Steelcase chairs come with a 30-day money back guarantee. This includes free return shipping and no restocking fees. The chair must be returned in new condition in the original packaging to receive the full refund. The Steelcase Leap and Gesture include one of the best warranties in the business. The frame of each chair is covered for the lifetime of the original owner. The mechanisms, gas cylinders, arms, foam padding, and casters are covered for a period of 12 years. This warranty is good regardless of the shift usage, which means the chair is rated for 24/7 usage. 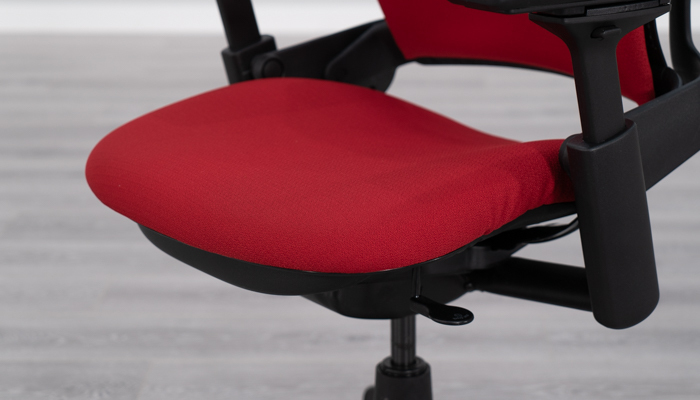 Steelcase will repair or replace your chair with a comparable product, at its option and free of charge (for materials and components) for any product, part or component which fails under normal use. If repair or replacement is not commercially practicable, Steelcase will provide a refund or credit for the affected product. Both the Steelcase Leap and Gesture chairs come with a standard 400 lbs. weight capacity. The Leap is also available in an oversized chair that is rated up to 500 lbs. I wouldn’t recommend the standard size Leap or Gesture for users up to 400 lbs. The seat won’t be large enough to comfortably fit someone that weight. When ordered in small quantities, the Steelcase Leap and Gesture are able to be shipped via FedEx Ground. Our chairs came in a very large box, with handles, and weighed approximately 70 lbs. Because of the size of the package, you may want an extra set of hands to move the box in the office. Inside the box, each chair is put into a plastic bag to keep it clean and reduce the opportunity for surface scratching. There is a large cardboard piece included with a bag of air to hold the chair in place. The box is designed to hold each chair and is perfectly sized to reduce any movement while in transit. Overall, both chairs were well packed and should arrive in perfect condition. If you’re looking for a well-built chair, both the Leap and Gesture are at the top of the category. The Gesture scored slightly higher than the Leap, with a 91 out of 100. The Leap chair was close behind, with a score of 90 out of 100. When looking at a chair’s components, we always pay close attention to how each of the components fit together and the imperfections that may exist. Low-quality components are more likely to be loose and will fit poorly. Plastic components tend to have imperfections in the injection molds and this will show up on the final product. Even though both chairs were built in Mexico, we found the fit and finish to be impeccable. Both the Leap and Gesture were made with a lot of plastics, which was by design. 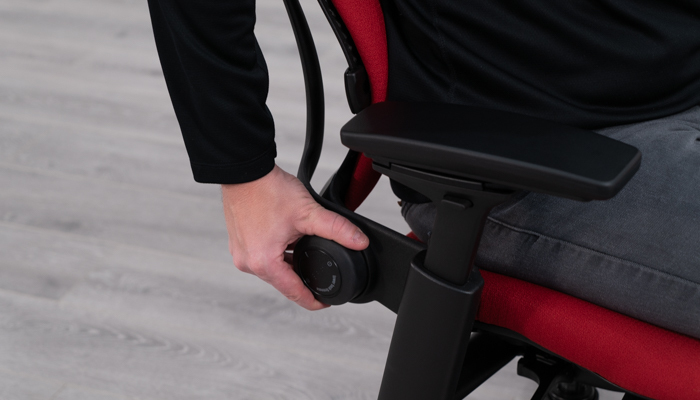 With a focus on the user being able to move throughout the day, high-quality plastics are required to allow for flexing in seats and backrests. Each chair featured some of the best looking plastic components of any chairs tested. The scope of users scoring is important for those who are looking to purchase a chair sight unseen. The way we score the scope of users is based on a single chairs ability to fit the widest range of users. After reviewing the Leap and Gesture, it was obvious they put a lot of focus on fitting the 5th to 95th percentile of the population. The first thing that really stood out was the number of people Steelcase used when developing each chair. 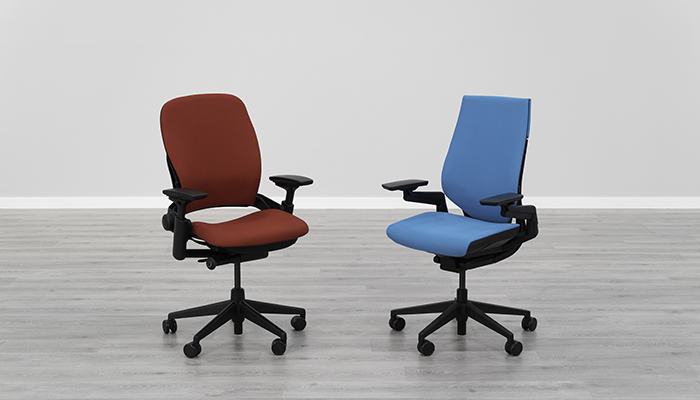 The Leap chair used eleven studies, that incorporated 732 participants, and was assessed by 27 ergonomics scientists from four different universities. For the development of the Gesture, they went even further, including over 2,000 participants on six continents. After seeing the response from nine different users during our testing, it’s pretty clear Steelcase knew what they were doing. Both the Leap and Gesture were clear cut winners in this category, with the Gesture being the highest ranked overall. We feel confident that most users who fit into the 5th and 95th percentile should be able to sit comfortably in either chair. One of the most subjective things about an office chair is how comfortable the seat is. Because of this, we had to take a different approach to score it. Using the average of nine user scores from our office, we were able to come up with a better idea of how comfortable a seat would be to most people. Both chairs did well in the category, scoring in the top five overall. The Leap was ranked first with an 85 out of 100 and the Gesture was an 80 out of 100. One of the unique things about both the Leap and Gesture, was their ability to score well with seat comfort, while using a thin seat pad. The majority of other chairs that scored well in this category included seat pads that were a minimum of 3” thick. Both the Leap and Gesture were able to accomplish similar scores with seat pads that are less than 2” thick. This is a testament to the level of quality of the seat pad used inside each of the chairs. In addition to the comfort of the actual seat pad, Steelcase incorporated a flexible seat pan on both chairs. This allows for the front portion of the seat pan to move with you as you change posture throughout the day. The flexible seat pan is designed to help reduce the pressure that would normally be found in the backs of your legs. The second category that we scored with an average of nine users is backrest support. Like the seat, we have found this area of the chair to be subjective. How much support a user prefers and where they like it can vary. When scoring backrest support we looked at how well the entire backrest supports your back, not just the lower lumbar region. The Leap chair received an 82 out of 100, while the Gesture scored a 76 out of 100 in this category. 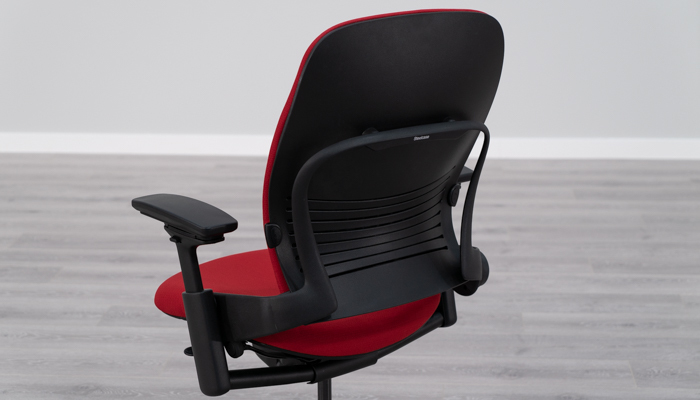 The Leap chair was our second-ranked overall for back support, with only the Eurotech Vera chair beating it. Its LiveBack Technology in the backrest allowed for some flexibility, which was nice as you move in the chair. There was a distinct difference in how the upper portion and the lower portion of the backrest moved. With the upper portion flexing back and out of the way, the lower lumbar area stayed in place, providing good lower support. The lower lumbar tension adjustment made a big difference with how much lumbar support you received in the leap. In moving the height adjustable lumbar bar you were able to fine tune where you received most of the lower support. While some of the lumbar support systems felt gimmicky, the Leap’s was definitely one of the best we tested. While the Gesture chair didn’t score quite as high as the Leap, it was still a comfortable backrest. The first thing I noticed when using it was the lack of a pronounced lumbar region. It still offered good support, it just wasn’t as noticeable as the Leap. This can be a good thing if you don’t like lumbar systems that push into your lower back. 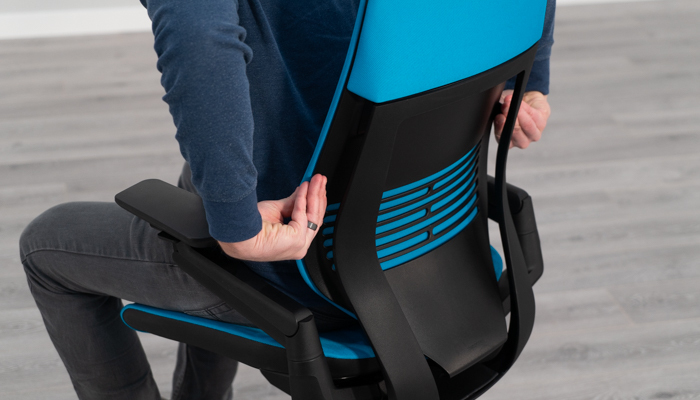 The backrest on the Gesture was flexible like the Leap, allowing for some movement in the chair as you shift throughout the day. This can be a nice feature, since most users like to be able to shift some as they work. While some movement can be a good thing, too much can be an issue if you’re trying to lock the chair in an upright position. Unfortunately, the Gesture won’t allow you to lock into an upright position without cranking up the tilt tension. This will remedy the problem for some, but if you decide to release the tilt lock, you’ll have to adjust the tension again. The final comfort score of the chairs is in the armrests. All nine users looked at two different aspects of the armrests: how well they were able to adjust to fit their body and how they felt on their elbows and forearms. Both chairs did well in this area, with the Gesture scoring 87 out of 100 and the Leap scoring 83 out of 100. Both chairs arm pads offered good softness for the elbow and forearm. While they weren’t as soft and squishy as Aeron’s arm pads, they were still comfortable for all-day support. The real difference in Steelcase’s arms was how adjustable they are. The Gesture comes standard with four-way adjustable arms that are unlike any of the other arms we tested. The armrests provide standard movements like height, width, depth and pivot adjustments. The real difference was how much width adjustment they provided, especially when paired with the other three movements. With over 10” of width adjustment, you were able to really fine tune the fit, creating arm/shoulder support like no other chair we’ve tested. Even though the Leap’s arms weren’t quite as wide-ranging as the Gesture, they weren’t that far behind. With four-dimensional arm pads, you were able to adjust the height, width, depth and pivot. One of the more unique things about the arms on the Leap was when you moved the pads inward, it revealed a full resource for your chairs ergonomic adjustments. This is a great feature, since so many users either forget or never learn how to use their chairs ergonomic adjustments. When we score the ergonomic adjustments on office chairs, we score solely on if the chair has the adjustment. So, if a chair has seat height adjustment, it would get the full number of points available. The only exception is tilt lock, where we scored based on the number of positions the chair would lock. The Leap chair scored 90 out of 100 and the Gesture 89 out of 100, ranking 1st and 2nd overall. Both chairs are considered to be fully adjustable ergonomic chairs and include almost every adjustment available. The only missing adjustment is a height adjustable backrest. While this could pose a problem for tall users, anyone under 6’4” shouldn’t have an issue. The likely reason for this function missing is the way Steelcase has tied the backrest into the seat and mechanism. Linking these areas of the chair created a unique movement when reclining in the chair. The Leap and Gesture each include an adjustable depth seat pan, but the Gesture is more advanced and my favorite overall. With most chairs, including the Leap, the seat pan depth is adjusted by using a lever, lifting some weight of the seat and sliding your hips forward or backward. This can be a bit awkward, depending on the user attempting the adjustment. The Gesture chair uses a knob; as you rotate the knob it is making the depth adjustment. This allows the user to remain seated in the chair and make the adjustment. The Steelcase Leap and Gesture come with a wide selection of standard upholsteries. 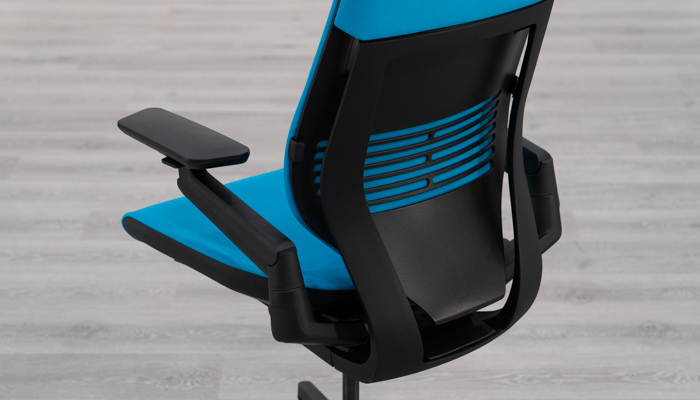 If you’re looking for a chair to ship quickly, the Buzz2, Cogent, Remix and Leather upholsteries ship in 4-5 business days. The Steelcase also offers the Billiard and Bo Peep selection of upholstery, but they extend the lead time out to 28 business days. If you’re after a highly adjustable ergonomic chair, you’d be hard pressed to find two better chairs than the Leap and Gesture. With each ranking first and second overall in our list for 2019, the closest competitors were eight points behind. While each of these chairs do a lot of things really well, how well they fit a wide range of users is their strongest suit. If you’re within the 5th to 95th percentile of the population, I feel confident that you’ll like one of these two chairs. If not, Steelcase offers one of the best return policies in the business. Either way, you can’t go wrong. 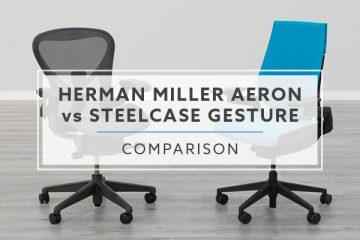 Herman Miller Aeron VS. Steelcase Gesture Chair: Which is best for you? 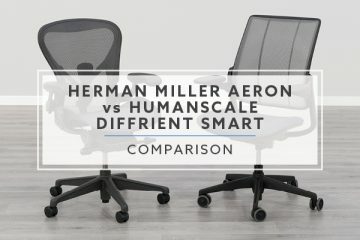 Herman Miller Aeron VS. Humanscale Diffrient Smart: Which chair is best for you?